Free shipping. Buy direct from HP. 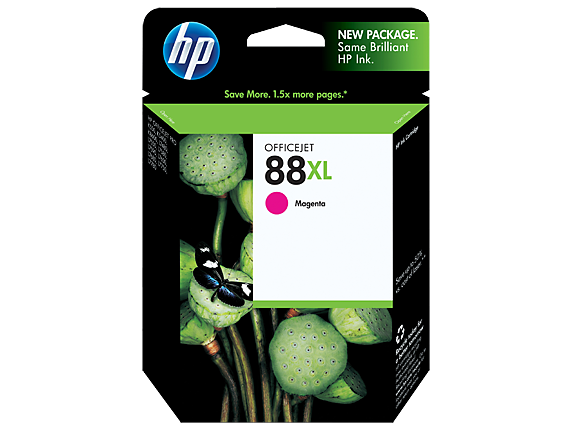 See customer reviews and comparisons for the HP 88XL High Yield Magenta Original Ink Cartridge. Upgrades and savings on select products. Enhance the quality of your documents, using office papers with the ColorLok symbol.Archived documents retain black text and color quality for decades without fading. Save time and increase productivity—manage your printers and supplies with HP Easy Printer Care. Print fast-drying pages at lightning speeds with HP ink cartridges and papers with the Colorlok symbol. HP is a leader in service and support, providing a warranty for reliability you can count on.Enjoy free, convenient recycling—cartridges returned through HP Planet Partners are recycled responsibly. HP proprietary inks prevent corrosion and clogging of the printhead, ensuring the best prints.HP printers, inks and papers are designed and tested together for optimal results.Each Original HP ink cartridge is brand new for exceptional printing performance. Print professional color documents at up to 50% lower cost per page than laser, using HP inks.Print economically with four individual ink cartridges—replace only the cartridge that needs replacing.Create print shop-quality marketing materials for less with ink cartridges, paper and software value pack.Save more on your frequent printing, using high-capacity cartridges. Enhance the quality of your documents, using office papers with the ColorLok symbol.Archived documents retain black text and color quality for decades without fading.Save time and increase productivity—manage your printers and supplies with HP Easy Printer Care.Print fast-drying pages at lightning speeds with HP ink cartridges and papers with the Colorlok symbol. HP is a leader in service and support, providing a warranty for reliability you can count on.Enjoy free, convenient recycling—cartridges returned through HP Planet Partners are recycled responsibly.HP proprietary inks prevent corrosion and clogging of the printhead, ensuring the best prints.HP printers, inks and papers are designed and tested together for optimal results.Each Original HP ink cartridge is brand new for exceptional printing performance.